Pseudoephedrine, a drug commonly found in cold, flu and hayfever medication, will be reclassified from a class C to B2 controlled drug under the Misuse of Drugs Amendment Act (No 2) 2011 on Thursday. Pharmacies will no longer stock bulk supplies of the drug and people will only be able to buy pseudoephedrine-based products using a prescription from their doctors. The amount of methamphetamine seized by Waikato police has quadrupled in the past year, making the haul the second-biggest in the country. The massive rise in busts of the notorious stimulant pushed the region's tally - $1.99 million - above Bay of Plenty and Counties Manukau police districts, which respectively netted $375,000 and $1.3m of "P", in the year to June 30. Waitemata was the country's "crystal" capital where police seized 2962.9 grams. Seizures of the highly addictive psychoactive stimulant are increasing in the Waikato, according to police seizure statistics released to the Waikato Times under the Official Information Act. So you could equivocate about what the stats mean but making it much harder for innocent users of pseudoephedrine to purchase the product hasn't curtailled the manufacture of methamphetamine. Today abuse is split into four categories; emotional, physical, sexual and neglect. In 2012 emotional abuse made up 56 percent of substantiated findings, physical – 15 percent , sexual – 6 percent and neglect, 22 percent. Child, Youth and Family record data about the nature of substantiated findings. Unfortunately information about the relationship between the offender and victim is not available. Despite this the Vulnerable Children Bill, currently under public consultation, focusses very strongly on vetting people who work with children. I've written to the Ministry of Social Development asking for information, "Regarding substantiated findings of child abuse during the calender year ending 2012, details of familial relationship between offenders and victims," and am awaiting an answer. In the meantime another organisation, ChildForum, appears to have pursued similar lines via the Ministry of Education. The information they have received under the OIA is reported rather sensationally in today's NZ Herald. * Teacher bit a child and twisted her hands and arms. * Parents not told their child had fallen off a slide and had to wait for medical treatment. * Student on teaching practice saw staff smacking children and dragging them by their arms. * Child found wandering on the street while centre was unaware he was missing. * Dogs roaming in play areas. * Staff not administering prescribed medication to a child. * Children left alone in vehicles. * Staff smoking near youngsters. * Food withheld from pupils. To put 247 into context, in 2012 there were 152,800 reports of concern to CYF. Only 14 percent of reports to CYF dveloped into substantiated findings. If the rate was similar for ECE complaints that would translate to 35. But any number between 35 and 247 would be a tiny fraction of the 195,000 children attending pre-school. Ironically, I can envisage these "horror" tales being used to campaign against beneficiary parents being required to send their children to Kindergarten etc from age 3 when statistically speaking a child is at greatest risk when at home with welfare-dependent caregivers. A recent Child Poverty Action Group report about child abuse claimed that, ” …the Ministry of Social Development and its predecessors have been researching and writing about child abuse for almost quarter of a century.” Wrong. Investigations extend back much further. CPAG says the most effective way to reduce child poverty is to give children's payments to all low income children on the same basis. They say a policy which relies on paid work is not a solution to child poverty. Any solution to poverty relies on somebody's paid work. CPAG are simply happy for it to be yours and not the child's parent. "Too many of our children are dying from poverty related diseases. Others bear life-long physical, mental and emotional damage, and grow up to endure poverty as adults," says St John. "The evidence is that families are slipping into ever more desperate situations especially with the implementation of recent very harsh and under-scrutinised welfare reform policies." Asking a sole parent to be available for 12 or more hours work per week after their youngest turns five is "very harsh"? Asking them to ensure their child is enrolled with a GP and attending school in return for state support is "very harsh"? The short term solution to child poverty is working parents with increased prospects of growing their income and re-partnering, and reduced prospects of rasing a child to become a beneficiary in turn. The long term solution is people having children when they are in a position to look after them independently, provide security and stability. A majority of the children CPAG identify as being in poverty were on a benefit at birth or shortly after. CPAG's solution - pay beneficiary parents more - will increase the size of this group. Even Labour, under Clark and Cullen, recognised that reality. The question is, does Cunliffe? And even if he does, is their solution a price worth paying for a prime ministership? In America we stand for equality. But for the large majority of us, this means equality of opportunity, not equality of outcome. If you are like most Americans, you believe we all should start at more or less the same place with more or less the same opportunities to succeed in life. But you also believe that, within reason, it's perfectly all right if we end up in different places. Despite claims to the contrary, no parent has ever been convicted for lightly smacking their child, or had their child removed by CYF. Indeed, CYF has guidelines on what a light smack is: "an open palm, sharp slap leaving no enduring mark or injury to the child." By itself "this is most unlikely to constitute physical abuse . . . and there is unlikely to be any basis for further action". So read the guidelines for social workers - published by CYF in December 2009 - as part of the prime ministerial review of how section 59 was working. It was authored by the chief of police, the head of CYF, and prominent child psychologist Nigel Latta. And it's the reason why - despite all the clamour - neither Prime Minister John Key nor Parliament shows any appetite for revisiting the smacking issue. Indeed, recent court judgments - one involving the Court of Appeal - have emphasised CYF's operating instructions. The courts have got involved only when other elements of alleged abuse are at play, or there are demonstrable injuries. So what does this mean - in practical terms - these school holidays? First, the anti-smacking legislation - or the section 59 amendment as it is more technically known - is, effectively, a non-issue. Beat your child, and you are rightly in trouble. Lightly smack them, and you're fine. Never use a belt, stick or similar - only an open palm is OK. I don't share Laws' confidence in the ability of CYF to discern. And there are certainly many cases of families having children removed once they come to the attention of the agency. Families who feel badly aggrieved. Families dragged through the court system. I sat through the court case of one such father preosecuted for 'shoving' his son. It's your child, your circumstance, your choice. It's easy for Laws to blithely counsel action you feel is your right. He used to do the same when he had his talkback show. Somehow though I don't think "Michael Laws said it was OK" will have any legal standing as a defence. A couple of weeks ago CYF chief social worker, Paul Nixon, had an opinion piece published in the DomPost. It wasn't on-line when I checked so I clipped and filed it in my 'child abuse' folder because it contained useful information. It is however available here. The Greens are complaining about crime statistics not containing family violence statistics here. The Government must ensure crime statistics next week show the true extent of domestic violence crime as CYF’s chief social worker confirmed today it is a key driver of child abuse, the Green Party said today. Women’s Refuge, the Pacific Islands Safety & Prevention Project Inc. and the Shakti Community Council Inc. tonight criticised the police crime statistics for hiding the true incidence of domestic violence by lumping it in with all assaults that occur in the home. The groups also claim to have noticed a trend of fewer prosecutions, more diversions for serious domestic violence offences, and a trend towards not charging offenders and relying more often on the victim being the evidence provider. 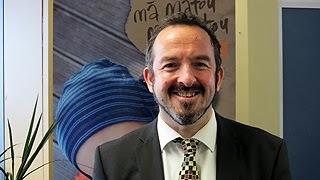 “This comes the same day that CYFS chief social worker Paul Norris wrote of the ‘toxic trio’ of domestic violence, parental substance abuse and untreated mental illness, that has led to a “dramatic rise in notifications of abuse and neglect of children,” Green Party women’s spokesperson Jan Logie said. People make mistakes. But if you're an MP and make it your business to know the agencies that relate to your portfolio you could fairly be expected to know the key people and their names. Just checked with the press releases at their website and no-one has picked up or corrected the error.